First sighting of the Surface Mobile? 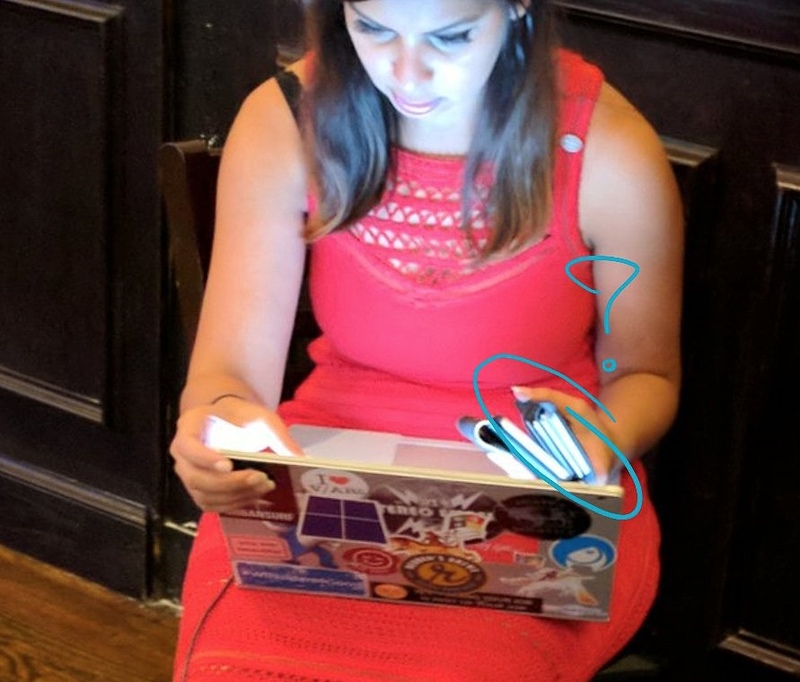 Spotted late at night at Microsoft Ignite by my source Peter Libbrecht was Windows 10 Insiders programme boss Dona Sarkar - with a couple of phones in 'folio' cases. Now, this may just be a wild goose chase we're starting down here, but one of the phones appears to be a clamshell or a folding phablet of some kind. Could this be one of the first real world sightings of the fabled 'Surface Mobile'? See the photo below and then let speculation rage - any other bets for what she's holding? It's obviously very tough to identify phones from their top ends, but it does make something of a feature of a device which is more than a 'slab'. In this case, two slab sections hinged together - too symmetrically to be a 'Communicator-style' clamshell, but about right for a folding phablet, as per the recent Microsoft patents. An interesting spot and it would make sense for Dona to have a prototype or two around her person - though if she were carrying this around this openly then I'd have expected more people to have snapped it by now? What's your bet? Am I making a fool of myself for jumping on this or is this a first sighting of the real deal? See also the last 'spot' of a Surface Mobile here, as part of an Azure ad spot. I do realise that part of the frenzy around such a device is fuelled by a complete absence of other first party mobile hardware, but on the other hand, 'there's no smoke without fire', so maybe this is real after all? If so, I'd bet at a commercial launch around the time of Redstone 4 in the Spring in 2018. Filed: Home > Flow > First sighting of the Surface Mobile?